This is our exclusive Chevy 14 Bolt Extreme Yoke Guard. 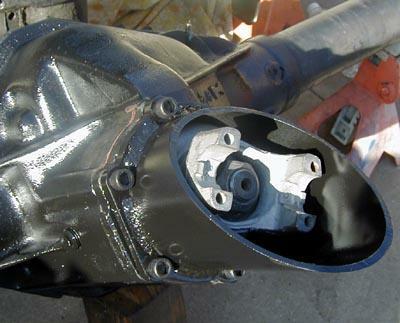 This guard will protect your drive shaft and yoke from damage while rock crawling. It's flange is made of billet steel that is CNC machined for a perfect fit. Thick wall tubing is also used to make the guard seriously heavy duty. New alloy steel socket head cap screws are also included. Works with the larger, 1350 series u-joints as well. Not shown in this picture is the 1/2" diameter drain hole. Quite possibly the best way to protect your yoke from rock damage with out giving up ground clearance. Testimonial: "When I opened the box to take a look at my Yoke Guard, the first thing I noticed was the quality of this product. Well made, fast shipping, reasonable price and excellent quality. What more could you ask for."